Since Sept. 2009, 477 breaches affecting 500 people or more each have been reported to the Office for Civil Rights (OCR) under the U.S. Department of Health and Human Services. In total, the health records of 20,970,222 people have been compromised, the OCR said. The Office for Civil Rights has been updating a list of the breaches on its website. The list is known to the health care industry as “The Wall of Shame,” according to the OCR. Six health care organizations listed on The Wall of Shame reported security breaches that involved one million or more records. Among the largest breaches reported was TRICARE Management Activity, the Department of Defense’s health care program, which reported 4.9 million records lost when backup tapes went missing. TRICARE, formerly known as Civilian Health and Medical Program of the Uniformed Services (CHAMPUS), provides civilian health benefits for military personnel, military retirees, and their dependents. Other major breaches included: Health Net, which reported 1.9 million records lost when hard drives went missing; the New York City Health & Hospitals Corporation’s North Bronx Healthcare Network, which reported the theft of 1.7 million electronic medical records; AvMed Health Plans in Florida, which reported the theft of a laptop with 1.22 million patient records; and Blue Cross Blue Shield of Tennessee, which reported the theft of an external hard drive with 1.02 million records. WellPoint, the largest managed health care company in the Blue Cross and Blue Shield Association, also reported 31,700 of its customer records were compromised during the three-year time period. WellPoint’s breach occurred via a hack to a network server, according to the report. The Nemours Foundation, a health care organization that runs children’s hospitals, also reported the loss of 1.05 million records when data backup tapes were lost. The breach notification and reporting is part of new rules under the Health Information Technology for Economic and Clinical Health (HITECH) Act, enacted as part of the American Recovery and Reinvestment Act of 2009. 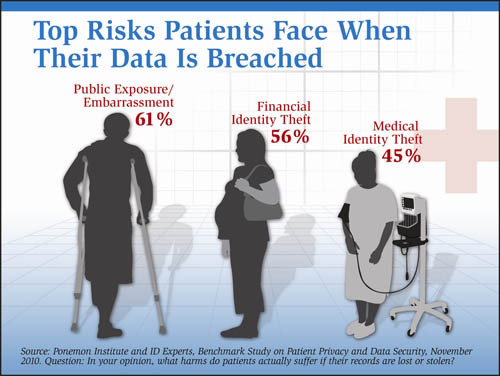 The rules not only require the public reporting of breaches but also increased penalties for violations of the Health Insurance Portability and Accountability Act (HIPAA), which requires organizations to safeguard patient information. About 55,000 breach reports involving fewer than 500 records where also reported to the OCR from 2009, according to Rachel Seeger, a senior health information privacy specialist with OCR. Theft made up 54% of the breaches, while hacking made up only 6% of the compromised data. Theft was followed by unauthorized access or disclosure for 20%, lost records and devices for 11%, improper disposal of records made up 5% and other/unknown categories made up 4%. “Most of the portable devices are being stolen out of cars or otherwise being lost. Many of these laptops are lost by an employee while in transit on public transportation,” Seeger added. But not all the data potentially exposed is lost by the health providers themselves. For example, in a statement issued in April last year, Health Net said it was notified by IBM, its IT vendor at the time, that it could not account for “several server drives,” which contained 1.9 million patient records. Health Net stated that it worked with IBM and other experts to investigate the incident, and it notified affected individuals whose records had gone missing “in fewer than 60 days, in accordance with federal law.” The company stated that no evidence has been found to indicate the records have been used inappropriately. “We voluntarily agreed to provide affected individuals with two years of credit monitoring, $1 million in insurance protection and reimbursement for costs associated with the freezing and unfreezing of an individuals credit,” Health Net stated. Hospitals, insurance plans and physician practices can avoid penalties by simply encrypting the health care data or by destroying the electronics that house the data at end of life. Unfortunately, too few organizations are getting the message. Under the HITECH Act, there are four categories of violations that reflect increasing levels of culpability. A maximum penalty amount of $1.5 million can be levied for each violation. When healthcare organizations violate HIPAA privacy rules, the U.S. Department of Health and Human Services (HHS) hammers out a resolution agreement with the organization. Under the agreement, the healthcare organization performs certain obligations, such as staff training, and makes reports to HHS, typically for a period of three years. The agreement likely would also include the payment of a resolution amount. When HHS is not able to reach a satisfactory resolution through demonstrated compliance or corrective action, “Civil Monetary Penalties” may be imposed for noncompliance. To date, HHS has entered into nine resolution agreements and issued civil monetary penalties against only one organization. HHS hit Cignet Health of Prince George’s County with a $4.3 million civil monetary penalty. Other top breaches are still under investigation, Seeger said. OCR said it found that Cignet violated 41 patients rights by denying them access to their medical records when requested between September 2008 and October 2009. “During the investigations, Cignet refused to respond to OCRs demands to produce the records. Additionally, Cignet failed to cooperate with OCRs investigations of the complaints and produce the records in response to OCRs subpoena,” HHS stated in a news release at the time. On March 9, Blue Cross Blue Shield of Tennessee (BCBS) settled with the HHS to the tune of $1.5 million for 57 unencrypted computer hard drives that were stolen from a leased storage facility in 2009. BCBS has since encrypted all of its hard drives, representing 885TB of data. BCBS said it spent more than 5,000 man-hours on the encryption effort, which cost the company $6 million. In June 26, the Alaska Department of Health and Social Services (DHSS) also settled with the HHS for $1.7 million, along with a three-year corrective action plan for the theft of an USB hard drive rom an employee’s vehicle. The hard drive had a relatively small number of records on it, representing only 501 people. That case represents the first HHS action against a state agency. “The settlement is based on multiple violations of the Rule, not the number of records involved in the incident that sparked the investigation,” Seeger said. “I think the fines and the list sends a strong signal,” she added.